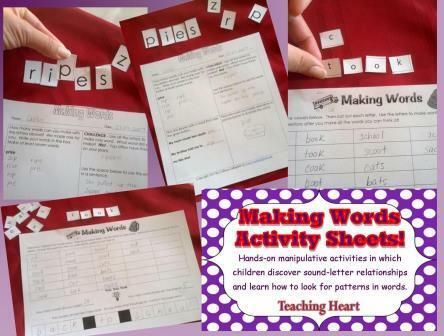 Making Words is an active, hands-on manipulative activity in which children discover sound-letter relationships and learn how to look for patterns in words. They also learn that changing just one letter changes the whole word. Making Words is an active, hands-on manipulative activity in which children discover sound-letter relationships and learn how to look for patterns in words. They also learn that changing just one letter changes the whole word. A perfect phonetic activity for working on decoding skills. The files in this set are zipped in both Word (so you can edit) and PDF. Making Words can be used as a whole group, small group or an independent activity such as a center, bell work, or substitute extras. Various Making Words – Each sheet includes ready to cut letters for a given word. Students cut out letters and use them to make words. Also includes four word building activities to match the words. These simple sheets include the letters to make the words below. Each sheet also includes a written activity. Page 2 of the preview document is an example of what the pages look like. They are simple sheets and all will look similar - so please see preview so you know what to expect if you buy this set! Monthly Seasonal Making Words – 20 different word phrases! There are 2 activities for each month (September – June) that correlate with the month. Page 3 of the preview shows an example of the format of these sheets. These sheets are all similar with different graphics for each month. Please see preview so you will know what to expect if you buy this set. The files in this set are zipped in both Word (so you can edit) and PDF.